The Lady Mavericks celebrate following their 2-1 victory over Dobie on Saturday night. 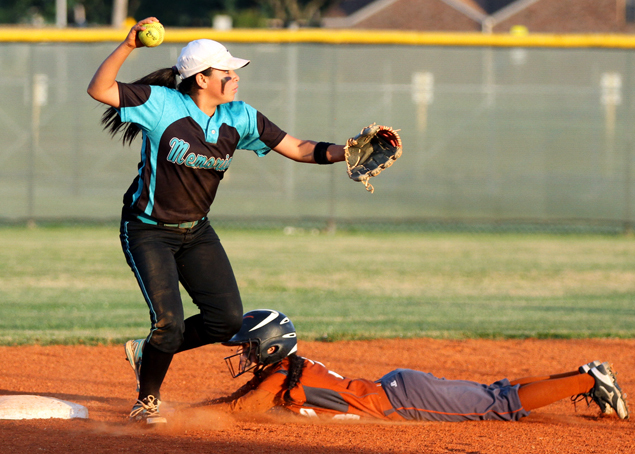 Memorial’s softball team cashed in a four-hit pitching performance by Nika Garcia and a two-run single in the sixth inning by Toni Garivey for a 2-1 victory over Dobie Saturday night that earned the Lady Mavericks the fourth and final state playoff berth from District 22-5A. With the stands nearly packed at the Pasadena ISD Sports Complex, Garivey broke up a scoreless tie with a looping single to right field with two out in the top of the sixth. The hit scored Katie Meyer, who had led off the inning with a walk, and Teagan Wyatt, who had reached on an outfield error. The Lady Longhorns reclaimed one run in the bottom of the seventh on a two-out, RBI single by Emily Wolfe. But with the potential tying and winning runs in scoring position, Garcia got Sady Olguin on a fly ball to Meyer in right field to end the game. The teams were forced into a one-game seeding playoff when both finished district play with 7-7 records and a split of their season series. Memorial, now 14-14 for the season, will take on District 21-5A champion Deer Park in bi-district play. The details of that matchup have yet to be worked out. Garcia, who struck out seven, proved to be the winner in a pitching showdown with Dobie’s Stephanie Buenrostro, who also hurled a complete game and also allowed only four hits. The Lady Longhorns, who finished the season with a 17-16 record, had a chance to take control of the game in the bottom of the third when they loaded the bases with none out. Audrey Medina singled, Mykala O’Connor walked and Wolfe reached base on an outfield error. But Garcia got out of the jam with two strikeouts and an infield grounder. Memorial's Nika Garcia delivers to the plate in the second inning. Memorial shortstop Tori Garivey retires Dobie's Valarie Colunga at second on a fielder's choice grounder by Alisson Bravo in the second inning. Dobie's Stephanie Buenrostro works the second inning. Dobie shortstop Emily Wolfe fires to first to retire Memorial's Tori Garivey to end the fourth inning. The end of a bases-loaded jam for Memorial in the third: Dobie's Emily Wolfe eludes a tag attempt by Memorial second baseman Sabrina Mata, but Mata had plenty of time to throw to first to retire Marissa Longoria for the final out of the inning. Dobie had loaded the bases with none out. Memorial Coach Christina Mata huddles with Tori Garivey in the fourth inning. Memorial pitcher Nika Garcia flips to first baseman Tabby Barrett for the final out of the sixth inning.